PRANA+ is a series of lights that actively responds to the human biorhythm. Alongside a timeless, filigree shaping this light convinces with details like the translational extendable luminaire head. With the latter the light reaches exactly the spot where it is needed and the lamp can still be placed freely and aesthetically – through this it becomes the optimal light solution for sophisticated and demanding office architecture. Additionally the patented base of the PRANA+ floor light is divisible and can be perfectly adjusted to any closed desk – even if closed on the side. Not only are the lights controllable classically via switch or touch panel but also with the PRANA+ app. PRANA+ uses an own WLAN-server that ensures highest reliability and safety. The floor light as well as the pendant light have two independently controllable LED-light units for upper and lower light. A comfortable ambience for well-being is created by the upper light. The direct lighting creates a focussed and optimal illuminated workspace. The light spectrum ranges from a warm white (2700 Kelvin) to daylight (6500 Kelvin) and has an infinitely variable control. Furthermore a special diffusor with a certification of UGR 14 was used, which is far more than the recommendation for working lights and ensures glare-free working in optimal illumination. 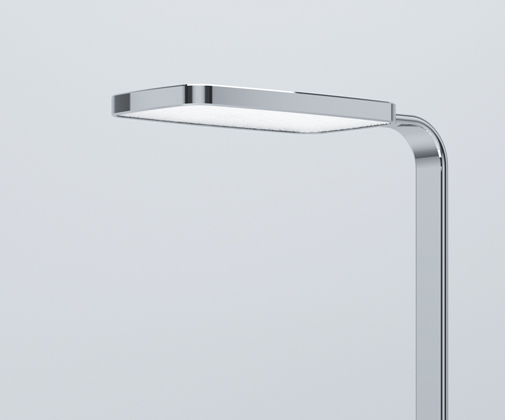 PSBZ defined additional corporate design elements for the completion of the light series PRANA+. Besides the logo and the product brochure the app was also designed. This allows the user to individually adjust the light and simulate different global light situations.